Phâro Sugaring provides you with natural, eco friendly products and has made sugar waxing a near spa experience with our natural, luxurious, New Zealand made gels. We have now added value treatments that can be offered immediately after Phâro sugaring or as stand alone services; these extended treatments will leave your clients skin nourished and rejuvenated. These sugar waxing treatments are done in 15 or 30 min sessions depending on the needs of your client’s skin and the area of the body covered. Choose from our range of the value added sugaring treatments that best suits the clients need or occasion. Bladderwrack, this form of kelp (seaweed) is a nourishing tonic for the skin. Bladderwrack is found on the coasts of the North Sea, the western Baltic Sea, and the Atlantic and Pacific Oceans and has been used medicinally for centuries. The main use of the herb has been for the treatment of cellulite. The high iodine content of the herb stimulates thyroid function which boosts metabolism. A nourishing tonic for cellulite with tiredness and dry skin, Bladderwrack also appears to assist in the problem of lipid balance associated with obesity, and where obesity is associated with thyroid dysfunction, this herb may help to reduce excess weight. Essential Oil of Rose has antibacterial, anti-fungal and antiviral properties, making it ideal to topically treat ailments including abrasions, burns and skin conditions. 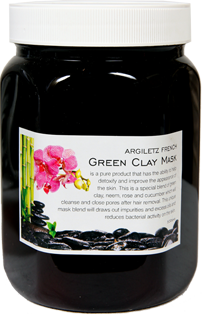 Eco Spa Argiletz French Green Clay Mask is a pure product that helps detoxify and improve the appearance of the skin. Argiletz® superfine green clay, exceptionally rich in minerals, is a fine clay powder of about 60 microns. This mask is a special blend of green clay, neem, rose and cucumber which will cleanse and close pores after hair removal. Neem is a natural antiseptic that soothes skin and heals eruptions like pimples and blackheads. It restores the skin’s natural oil balance and also stops scaling. Eco Spa Rose Floral Water tones and revitalises the skin, giving a cooling and refreshing effect making the skin supple and youthful. Cucumber is a natural cleanser and moisturiser which cools and nourishes the skin. It removes dead skin cells and is effective for dark circles around the eye area. The key purpose of this unique mask blend is to draw out impurities and excess oils and reduce bacterial activity on the skin. The moisturising effects of Eco Spa Rose Floral Water enhances skin tone and smoothness, and cleanses and closes the pores. 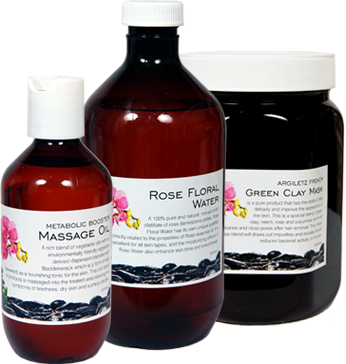 Eco Spa Rose Floral Water is a 100% pure and natural, non-alcoholic distillate resulting from the distillation of Rosa Damascena petals (not just water to which drops of essential oil have been added). With a light, refreshing fragrance, Eco Spa Rose Floral Water has its own unique qualities directly related to the properties of Rose essential oil. It is excellent for all skin types, and has astringent properties that help to reduce the appearance of fine lines and wrinkles. Ask for the sample pack with your next order.